An Open Letter To Ask.com - Where Is It? An Open Letter To Ask.com – Where Is It? I’ve been watching your most recent television ads that show off your blended search results by demonstrating a search for "eagles of death metal" and felt compelled to write a blog post about the commercial. Really?!? No suggestions, even though you’re currently running an ad using "eagles of death metal" as a demonstration search? Couldn’t you have reasonably expected that people would conduct that search as a result of your TV commercial? I admit I’ve been critical of you in the past but this time I was planning on writing about your new ad and that you too are offering blended search results. So I went to YouTube and searched for the new ad but all I got were old TV spots. I widened my search by doing the same at Google Video. No luck. I tried iFILM and Yahoo! Video and DailyMotion and MetaCafe. Still no luck. Not only did you not find your most current ad for me, you found none of your TV ads at all, at least not as blended results. It’s not that I don’t like you, I’m just disappointed in you, Ask.com. You told me how great you are at finding stuff, but you can’t even find stuff in your own backyard. There are a zillion people smarter than I who can help you improve your algorithm but I could lend you a hand on the video marketing side of things. 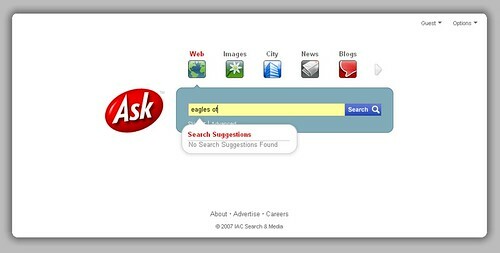 Ask.com TV Ad Targeted To SEMs? Where Does The Business Data For Local Online Business Listings Come From? Ask.com can apparently find everything but stuff in their own backyard. I’m a fan of Eagles of Death Metal, so when I saw the search ad I went straight to Ask.com to see if they were the plethora of information they claimed to be. 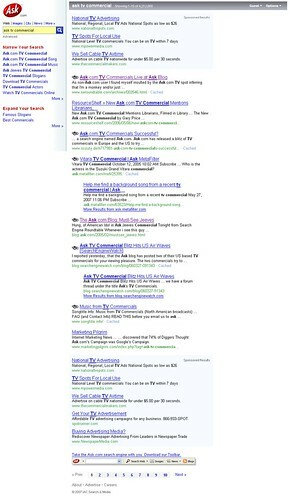 Once I typed the whole thing in the page looked just like the one they showed on the ad, but no search suggestions. Even now, two weeks after the ad aired, still no suggestions. Surely enough people attempted that search to trigger something. Maybe there isn’t anything to trigger?